February vacation AND Ash Wednesday…a double whammy! All you need for a great meatless meal during Lent! Surviving February Vacation week? I hope so! I know a lot of schools don’t actually have a vacation in February, but in our neck of the woods we do, and I’m always grateful for the break. Have you been doing anything special? If you live near a national state park, check out their website. Oftentimes they have special things planned for school vacation weeks. If not, you can always set up an indoor campsite with tents or forts. Alex set up “Camp Rock” in our house the other day with her guitar and all kinds of stuff in her tent in her bedroom. Kept her amused and busy for quite some time. I always find forts to be a good use of time also. They stay in them for hours. Alex was set up in her tent for a long time the other day! 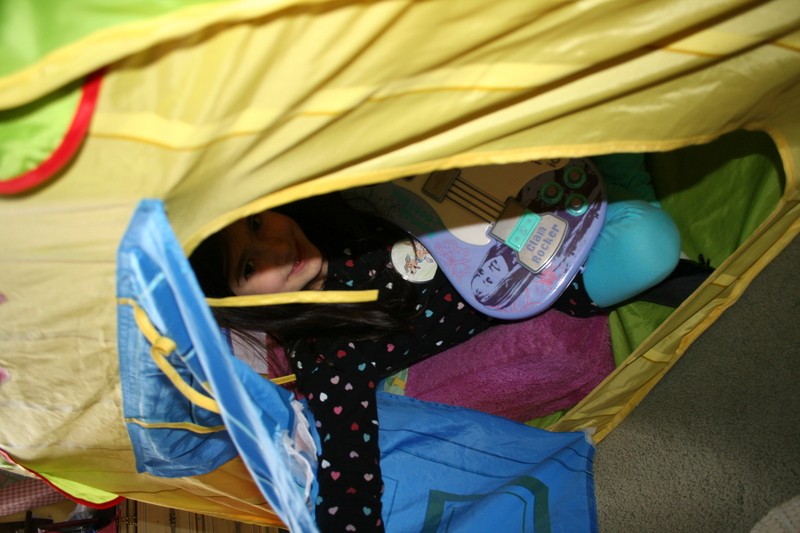 Forts and tents = tons of fun! This week Lent begins in the Catholic religion, which means for my family that today is Ash Wednesday and so begins the 40 days of Lent. During Lent there are several practices we follow, one of which is the giving up of meat on certain days, namely holy days and Fridays. 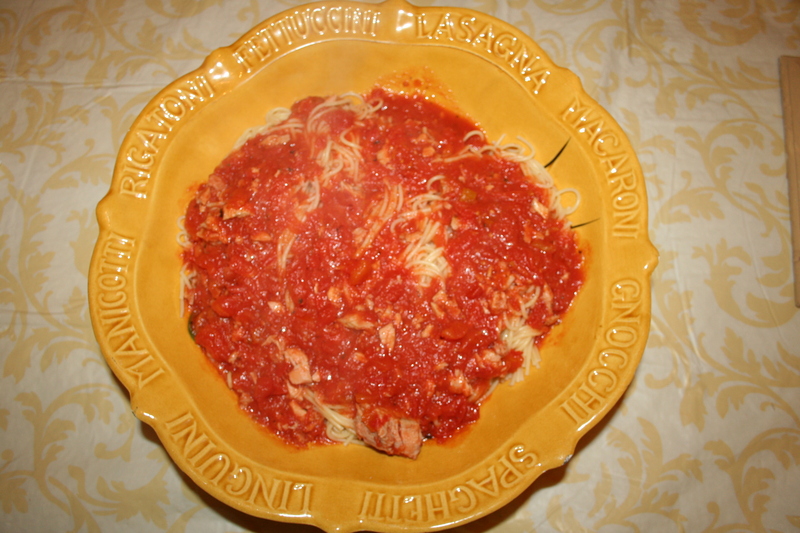 One of our favorite meatless meals is Grandma Rose’s Tuna and Spaghetti. 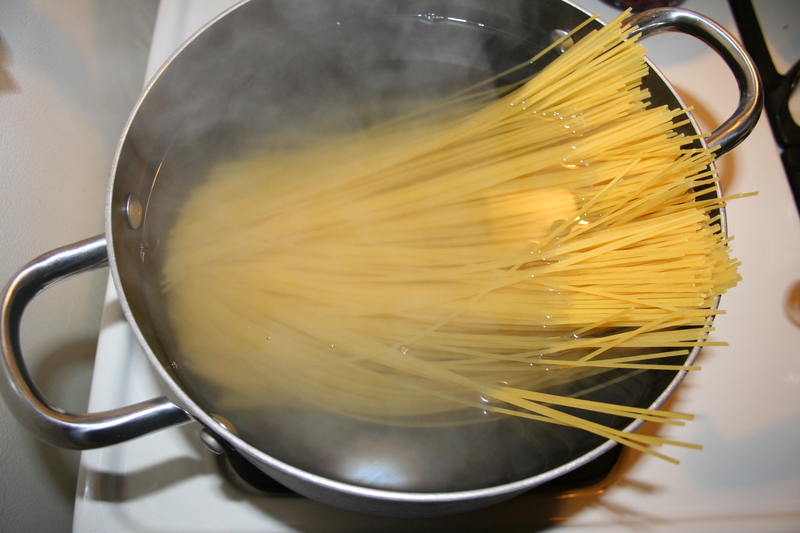 It’s pasta with a twist. It’s a Depression era meal, one that she grew up on back in the 1930’s. It’s one of our family’s favorite meals, and whenever people hear about it, they first say “ewwww” til they taste it. I’ve never had anyone try it and not like it. If you’re looking for something different to try during your 40 days of Lent, or just in general (because we do it this all year long too) give it a whirl and let me know what you think! 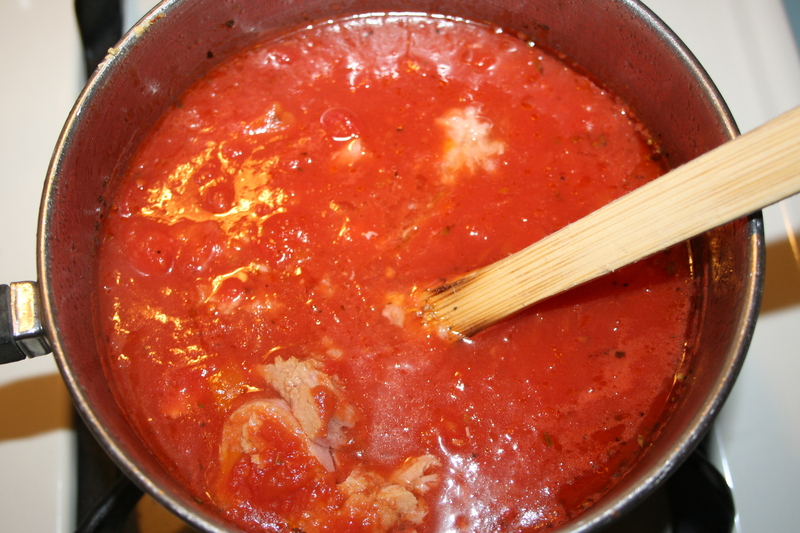 There's nothing like a pot of bubbling sauce simmering away on the stove! Use 2 qt. sauce pan and brown the garlic and oil. Add one cup of water, plus salt, pepper, oregano and basil. Cook on low heat for 1/2 hour. Add tuna, including oil in can, and continue to simmer for 15-20 minutes. Grandma Rose gave us her pasta bowl for serving our pasta. I think of her every time we use it and she's so glad we get lots of use out of it! ← Welcome to the jungle…it’s school vacation week!